This is a harvest festival - the Tamil equivalent of Thanksgiving. It is held to honor the Sun, for a bountiful harvest. Families gather to rejoice and share their joy and their harvests with others. The Sun is offered a "Pongal" of rice and milk. There is much excitement and preparation. New clothes are made or bought. The homes and yards are cleaned days ahead. Tasty aromas of Palakaram (sweet snacks) fill the air for days ahead. On the day of Pongal, early in the morning, everyone bathes and wears new clothes. Family members then jointly draw the kolam (a decoration laid on the floor). Rice flour (plain and coloured) is used to draw the kolam. Parallel straight lines can be drawn using a cylindrical rod (Ulakai) as a guide. A kolam can be a plain one or can be artistically drawn with symbols of cosmic interest. 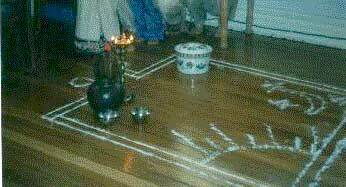 The kolam defines the sacred area where the pongal is prepared. Within the perimeters of kolam, typically, firewood is used to cook the rice. The Pongal is set up in the direct view of the Sun (East). Traditionally, the kolam is laid in the front or side of the house, but in cold climes where cooking indoors with firewood is hazardous, the pongal can be prepared in kitchen and brought to the location where kolam is set up (which could be indoors, like your Sun-room!). The moment of climax is the spill over of the pongal during cooking. The spillover of milk is a propitious symbol of abundance. Sometimes, firecrackers are lit to signify the moment. Once the pongal is ready a Padayal (the offering) is first made. Sharing of the Pongal with friends and relatives follows a few minutes of meditation or a prayer. Thai Pongal is celebrated on January 14th every year. The month of Thai (January) is the harvest season in the Thamil homeland spanning from Thamil Nadu to Thamil Eelam. Pongal refers to rice cooked in milk and sweetened with brown sugar (chakkarai, from which the English word jaggery is derived). On a full scale it is a three-day festival of nature-worship. It includes feeding the birds that are part of the beauty of nature, and offering thanks to the cattle, Mattu Pongal, which gives milk and plough the fields. Jallikkattu is a peaceful sport involving bulls celebrated by young men as a part of 3-day Thai Pongal. 1. Pongal Paanai (clay-pot) is decorated around its neck with mango leaves. 2. Boil water & milk (without the rice) in the paanai. 3. When the milk spills over say "Pongal, Oh Pongal" and add rice to the paanai. 4. Once the rice is cooked, add chakkarai, katkandu (sugar), honey, raisins & cashews. 5. Few pods of Cardamom enhance the flavor of pongal. 6. Once the mixture is ready for serving set up the Padayal on three banana leaf plates. After a few minutes of meditation or prayer by the family & friends, Pongal is served. The Padayal is offered to the senior members of the family first.